Solar energy is a primary source of renewable energy. Solar energy can be used for the direct supply of solar heat to buildings and industrial processes. Solar based electricity can be produced by photovoltaic cells, or through steam turbines by the concentration of solar rays. 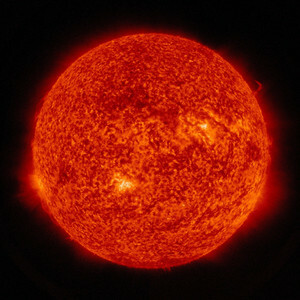 Solar energy can be used for the production of hydrogen which can be utilized as fuel. The technologies that harness solar energy are broadly characterized as either passive or active. Active solar techniques include the use of photovoltaic systems, concentrated solar power and solar water heating to harness the energy. Passive solar techniques include orienting a building to the Sun, selecting materials with favourable thermal mass or light dispersing properties, and designing spaces that naturally circulate air. The solar photovoltaic system consists of an arrangement of several components, including solar panels to absorb and convert sunlight into electricity. Concentrated Solar Power (CSP) systems concentrate direct sunlight to reach high temperatures. This heat can then be used to power a steam turbine which drives a generator. Solar water heating is the conversion of sunlight into heat for water heating using a solar thermal collector. Growing interest in solar energy has highlighted a need to harmonize the way in which the resources are reported. Investors, regulators, governments and consumers need a standard comparison framework for solar energy resources to assess energy sustainability scenarios at project, company, country, regional or global levels. The application of UNFC to solar energy resources could not only improve the view of energy sustainability but also greatly facilitate the economic evaluation of solar energy projects and the raising of finance. View an introductory video on application of UNFC to solar energy. A Solar energy sub-group under the Renewable Energy Classification Working Group has been established to develop the specifications for solar energy resource classification. Development of specifications for the application of UNFC for solar energy is under progress.